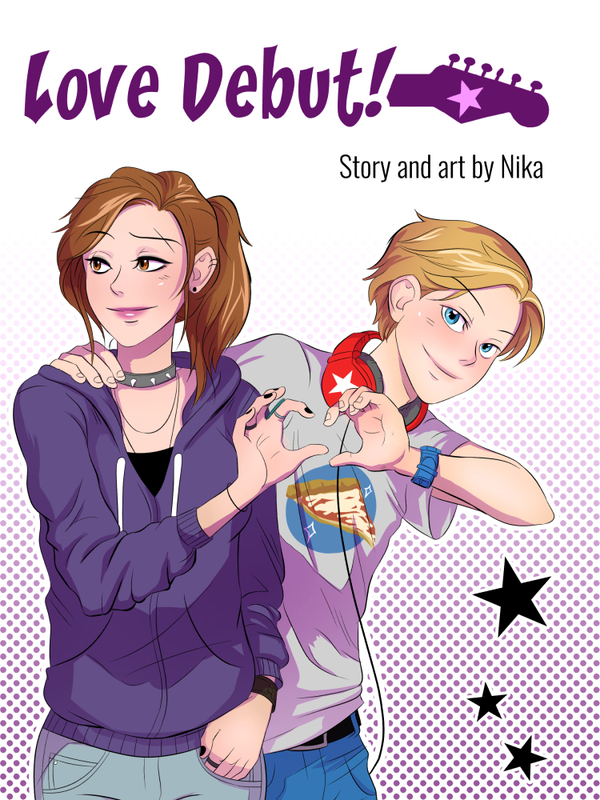 Love Debut! began its run in early September 2014 and concluded in January 2017. 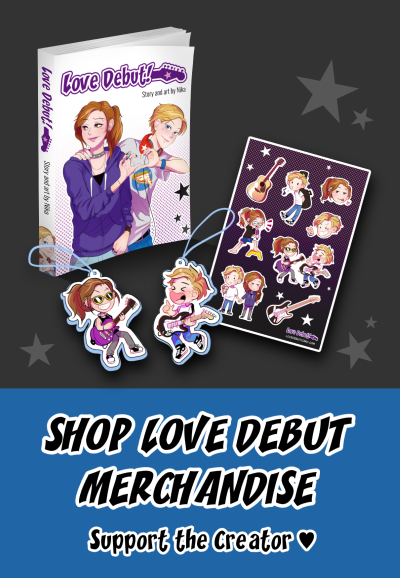 A successful Kickstarter campaign in March 2017 helped bring an updated version of “Love Debut!” to print, which is now available in the “Love Debut!” Tictail store. Genre: Slice of life, romance, drama. Style: Black and white, digitally created. Length: Estimated to be about 200 pages upon completion. Description: Nick Thomas has charming good looks (though he wouldn’t cry if he were just a bit taller), great friends, and a music career that is finally starting to take off! There’s just one problem — he’s not singing any of the music he really wants to sing… How will an unexpected encounter with Sara Hofmann, daughter of the late pop singer Sharon West, challenge him to live up to his dreams? Nick Thomas: An aspiring singer, Nick’s already had more success at age 16 than most, and he’s looking forward to finally getting his career off the ground. His unabashed charm makes him easily likable, and he is never short of friends wherever he goes. Sara Hofmann: Daughter of two music industry heavyweights, Sharon West and David Hofmann. She used to sing in contests as a kid, but since her mother’s death, has withdrawn entirely from the entertainment world. Now she works as a waitress when she’s not in school. David Hofmann: Sara Hofmann’s father, and husband to the late Sharon West. He works as a music producer. Jessica “Jess” Madden: Another one of Nick’s closer friends. She and Nick have some romantic history. Sharon West: Famous classical singer in the 1990s, she lost her life following a fatal car accident. She is survived by a husband (David Hofmann) and daughter (Sara Hofmann). Ross Zhao: Nick’s agent, she is an astute businesswoman who has worked her way up from the bottom. Will Zielinski: One of Nick’s closer friends, he sometimes lacks a filter but generally means well.